The hottest holiday promotion of the season is in full swing with the 25 Days of Razor Instagram contest! 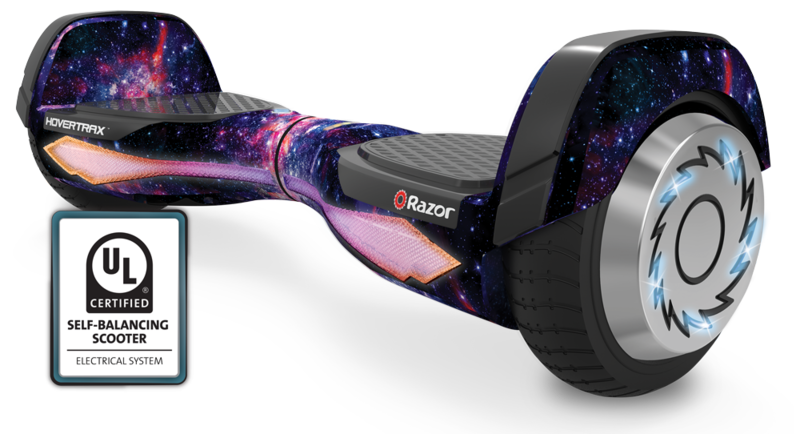 From December 1st through the 25th, Razor is giving away a different ride every day. Yup, you heard us right – a ride a day! From Dune Buggies and Dirt Quads to our hot new Hovertrax 2.0 and even a Crazy Cart, we’re giving it all away. Follow @RazorWorldwide on Instagram and watch for our #25DaysofRazor post each morning. That’s it! One lucky winner a day will be selected at random and notified. *Winners must be 18 years or older and comply with the criteria outlined in our rules. See what we’re giving away! 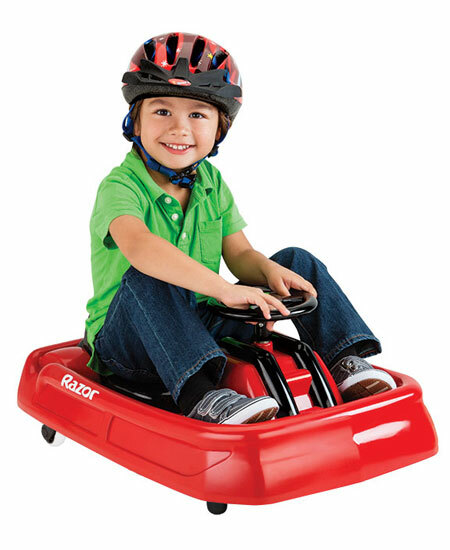 A5 LUX: Extra-large urethane wheels make the Razor A5 Lux kick scooter an extra smooth ride. Easy to fold and ready to go, the A5 Lux has a super strong aluminum t-tube and deck to comfortably support riders up to 220 lbs. Crazy Cart: Drive, spin, or drift like a pro – at home! Drive like a go cart or lift the Drift Bar to kick into Crazy Cart mode. Patented drift system allows the driver to vary the rear caster angle so you can drive and drift forward, backward, sideways, diagonally, and everything in between! Crazy Cart Shift: Designed specifically for younger drivers, the Shift delivers the drifting and driving fun of the original Crazy Cart in a simplified platform tailored for pre-teen drivers. 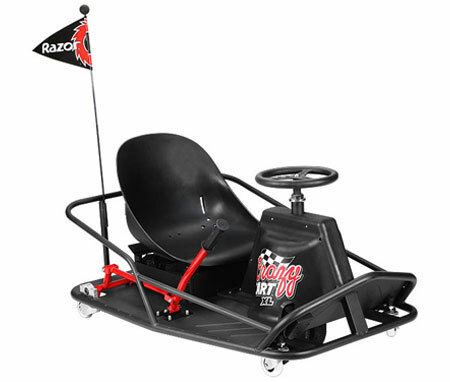 Crazy Cart XL: The Ultimate Drifting Machine just grew up, with a full-size, high-powered drift cart for the kid in all of us! Dirt Quad: When the backyard becomes too groomed and the sidewalk too smooth, the Dirt Quad enters with unlimited adventure. 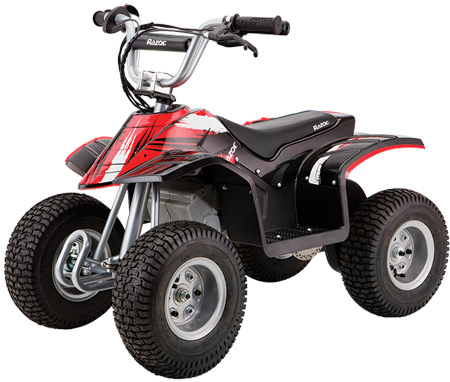 The four-wheel Dirt Quad is built strong and sturdy to conquer tough trails and big bumps. 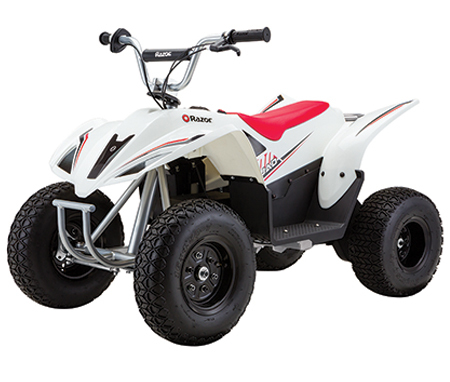 Dirt Quad 500: Big enough to tackle rugged off-road terrain, this grown-up, pumped-up version of our Dirt Quad will get your adrenaline rushing with its authentic moto-styling, larger frame, and high-torque motor. Dune Buggy: This vintage-cool ride will give older kids and teens plenty of buggy thrills, complete with a bucket seat, diamond plate floorboard, knobby tires and terrain-following suspension. DXT Drift Trike: With its full-size steel frame, moto-style construction, and 10″ slick surface rear wheels, the Drift Trike is built for edge-of-your-seat downhill drifting action, from freewheeling straights to the tightest curves. DXT Electric Drift Trike: With its full-size steel frame, moto-style construction and 10″ slick surface rear wheels, the DXT Drift Trike is built for edge-of-your-seat downhill drifting action from freewheeling straights to the tightest curves. 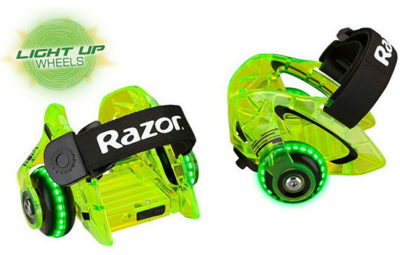 Electric RipStik: Put the power of carving action in the palm of your hand! With its innovative hub motor and lithium ion battery, the RipStik Electric unleashes a continuous flow of twist and carve action for an amped up ride at speeds of up to 10 mph. Hovertrax 2.0: The world’s smartest electric scooter, Hovertrax 2.0 features EverBalance auto-leveling technology for a safer, easier mount and smoother ride, indoors or out. Coast, race, or commute—safety-certified Hovertrax 2.0 is the radical new way to ride! Hovertrax DLX 2.0: The Hovertrax DLX includes all the incredible hover-board-like features of the Hovertrax, plus increased top speed, a smoke chrome finish, and futuristic blue LED lights. 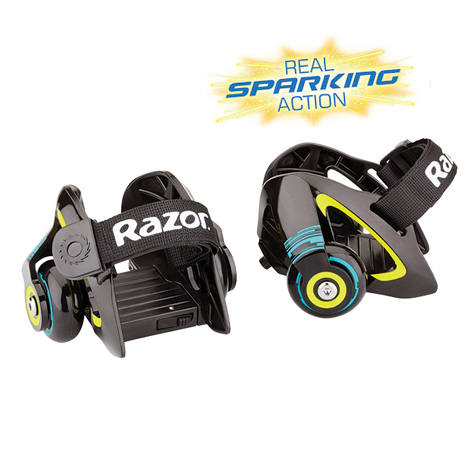 Jetts: Fire up your afterburner and get your spark on with the high-flying Jetts by Razor. Just step up, strap down and take off with these easily adjustable, always awesome heel wheels to transform your ordinary sneakers into the hottest way to roll. Jetts DLX: With two different ways to light up your ride, Jetts DLX Translucent Green Heel Wheels are the brightest way to roll! Just step on, strap down, and take off to activate the light-up wheels or press down to leave a shower of sparks in your trail! MX500: Authentic dirt bike frame geometry and a high-torque, variable speed motor deliver a super-charged experience, while large tires ensure a smooth ride and maximum power transfer for climbing those dirt hills ahead. Pocket Mod Bellezza: The perfect gift for a girl with a passion for fashion, the Pocket Mod™ Bellezza blends vintage style with high performance to recreate the classic Italian scooter. Power Core™ E90™: The Power Core E90 ups the ante for electric scooters, rolling out a ridiculous 80 minutes of continuous ride time and fifty-percent more muscle power. 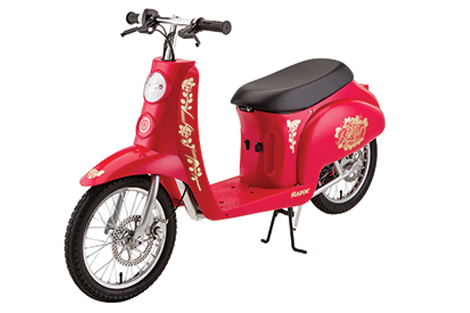 Its innovative hub motor delivers a more efficient, maintenance free ride, while the steel frame, lighter weight and increased torque take performance to the next level. RipStik: Just twist and go! 360° inclined casters and a pivoting deck provide a unique carving motion, for the thrill of surfing and snowboarding on dry land. Its unique twisting motion moves you forward without pushing off. RipSurf: The RipSurf’s patented design allows riders to carve and cut like a real surfboard, but on dry land! Riding on two high-performance caster wheels and an authentically styled polypropylene deck, this is one ride-on that’s ready to make waves! RSF650: Built for high-speed performance, this power bike packs a serious punch with its authentic street bike geometry, steel trellis frame, and variable speed, high-torque motor. 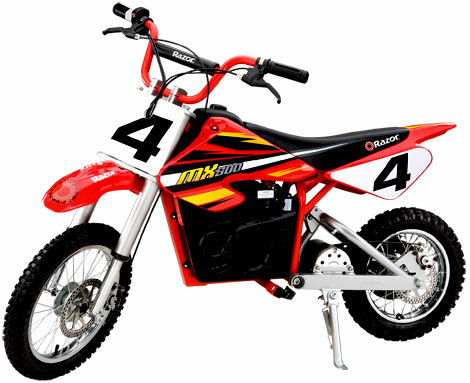 SX500 McGrath: With authentic MX frame geometry and faithful reproduction of Jeremy’s big bike, we offer you the perfect product for your little champion! 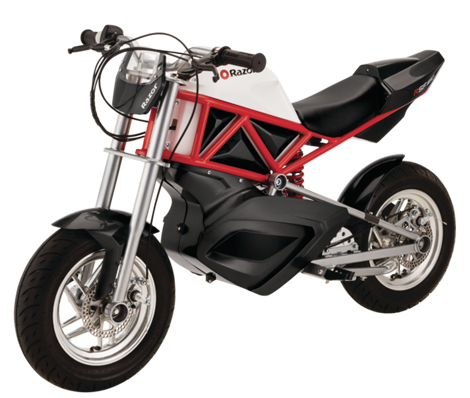 Motorcycle-spec tires with front and rear specific tread, disc brakes and dual suspension make this electric ride ready to rock the dirt. Razor Jr. t3: Easy to turn and hard to tip over, the T3 is the perfect introduction to the world of Razor scooters, with a patent-pending three-wheel design that helps young riders build core balance and riding skills.